Auroraskye gave this 5 stars! 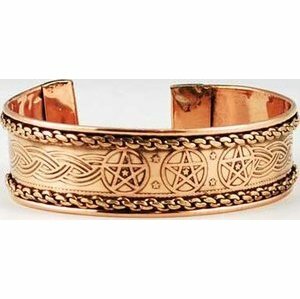 Made of copper, this bangle bracelet is elegantly decorated with the engraving of Celtic knot work and the central image of three small Pentagrams. Adjustable. 3" x 3/4"
Rated 3 out of 5 from 2 reviews. Reply: When you receive items damage or defective, please contact us through the contact form on this page. We will replace, refund or reship as you request.